Does Maximum Aerobic Function (MAF) Training Work? Back in September 2011 I asked if anyone had tried the maximum aerobic function (MAF) training by Phil Maffetone (PDF). It seemed like an incredibly simplistic approach and I was a little skeptical about the efficacy of such a "slow" approach to running so I threw the question out there. After a lot of research and some good feedback from others I took a whole-hearted plunge into the world of MAF training on 23 January this year. I didn't take the plunge sooner as I was still very concerned about the incredibly slow pace I'd be training at and instead opted to finish out 2011 and most of January 2012 mixing up times and heart rate ranges using some of the ideas garnered from a huge article by John Hadd Walsh known as "Hadd’s Approach to Distance Training" (PDF). This served me well and I was soon building a good aerobic base and clocking up monthly totals I'd not seen before: October 2011: 216km and November 2011: 252km. As I said, this served me well, but there was still this niggle in the back of mind: "What would happen if I trained to the ideas of MAF?" Some of my training runs had been pretty close to my calculated MAF range so I'd started to get used to the slower training pace. So I bought Phil's big yellow book, read it, put my pride in my pocket and dived right in. Those who know me will know I'm actually 33, and have been for the entire time I've been whole-heartedly committed to MAF training this year, so I'm not entirely sure why I chose 32 when performing the calculation. I can only think I did the calculation sometime last year and didn't think to reduce it by one after my birthday. That said, I doubt 1 BPM really made that much of a difference. I then took 5 off that figure to set a lower heart rate and thus setup a range of 148 - 153 BPM. Now this isn't part of MAF. If I recall correctly, there is no mention of a lower heart rate to keep above, however I decided I'd like a lower heart rate to try and keep all my training within a set range. This would allow me to easily judge how my general well-being, health, mood and the weather affected my training. All warm ups and cool downs were performed at a heart rate lower than 148 BPM. After an initial test on 13 September, I decided on a simple traffic-free flat 10km out-and-back (5k each way) route along the Thames as my test route (instead of chugging round a track until I got dizzy) and 30 January 2011 I performed my first MAF test for the year. It wasn't too bad, but wasn't brilliant. Every kilometer, except the first, took over 5 mins to cover. With my initial test out of the way, I set to doing all of my training in the 148-153 BPM heart range and as I did so I increased the time I ran. Soon I was easily running over an hour a day, every day, without feeling tired. I felt like I'd been for a run, but I wasn't knackered and breathing heavily at the end of it. I really started to enjoy my running again and re-introduced the Sunday long run too. These were done slightly differently in that I ran the first hour with my heart rate below 148 BPM and then the rest in my MAF range. This proved to be a great idea as I felt great after each long run and could easily head out for an hour on the Monday morning, which I normally do. As a result my mileage climbed to new highs and my race times came tumbling down. More on both of those coming in a post next week when I summarize the year's running. As you can see, bar a few anomalies (due to weather, stress etc), almost every MAF test showed an improvement with a huge leap between the May and July tests which I think can be attributed to re-introducing my Sunday long runs and a more concerted effort to follow a low-carb, high-fat diet (LCHF). Interestingly the last 3 MAF tests had all but the last kilometer covered under 5:00/km. I've not had a chance to do another test this year as mother nature has decided the Thames isn't wide enough around Reading and really needs the path I run on too 😉 . ... and it works very very well, and best of all, I went into every race feeling fresh without doing any tapering what-so-ever. 1. It forces you to go right back to basics and run long and slow and consistently. Every good coach will tell you about the importance of building a good aerobic base, but very few emphasize this enough. What's more the likes of Runner's World don't make it any easier as "go out and run slowly and longer to get faster" really doesn't sell magazines, not that anyone would believe the article anyway. 2. It is at a sufficiently slow speed that it is entirely aerobic and as a result it forces you to become more of a fat-burning machine than a carb-burning machine. With my switch to a LCHF diet, I've found burning fat to be a far superior source of fuel than carbohydrates and performing MAF shorter runs (less than 2.5 hours) on an empty stomach was hardly an effort. Long runs definitely needed a little bit of a LCHF breakfast. So am I finished with MAF? Not on your nelly. I plan to continue with almost all of my training runs in future being within my MAF range. I will however be introducing a change next year. 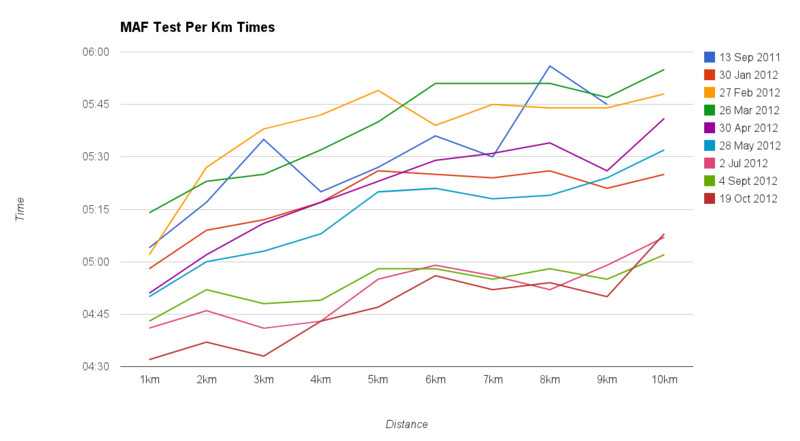 I think I now have quite a big aerobic base - it's nowhere near that of the elite and top club runners, but a heck of a lot closer than it used to be - so I'm going to start introducing one fortnightly race-specific training session that really taxes me and trains my body for the race ahead. I can't say I felt the need for any race-specific training last year, but given my times continued to improve through the year as I trained and raced more, I think it's worth a try. Worst case scenario: I find they start to have a negative impact and I'll either reduce the frequency or drop them entirely. One thing is for sure: the MAF training and the Sunday long runs will not be going anywhere. So if I have one bit of advice for runner it is to take some time out, read Phil Maffetone's Want Speed? Slow Down PDF and give the MAF method of training a go. It really works. Try it exclusively for 3 months and see what happens to your running. You'll be very surprised.